Marketers who have been pouring huge sums into digital advertising are wrestling with several recent events that add to a troubling picture: some are finding they can’t be sure how well that money was spent or what they’ve received in return for it. The lack of transparency that plagues the advertising industry was on stark display this week. Revelations that Facebook Inc. overestimated by up to 80% the average time people spent watching video ads on its platform shocked the media and marketing world. Meanwhile, Japanese ad giant Dentsu Inc. admitted on Friday it overcharged at least 111 companies for internet ads. The mea culpa was prompted by a complaint from Toyota Motor Corp. that its internet ads weren’t having the promised impact. Dentsu apologized and blamed overworked employees for the overbilling. At the same time, marketers increasingly are questioning whether their ad agencies accepted rebates from media companies without telling their clients. 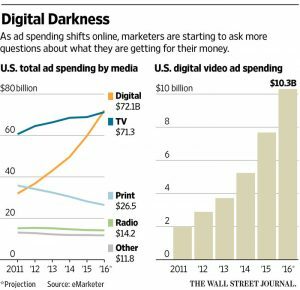 An industry probe earlier this year into rebates highlighted digital advertising deals as a key area of focus. Companies including General Electric Co., J.P. Morgan Chase & Co., and Nationwide Mutual Insurance Co. have launched audits of their agencies. Ad companies have denied wrongdoing. These developments add to the nagging sense for marketers that digital advertising—for all its promise as a way to reach consumers who are tethered to mobile devices and are spending less time on traditional media—has real pitfalls and risks. The lack of transparency and trustworthy measurement in online advertising will be among the issues weighing on ad executives gathering in New York next week for annual Advertising Week festivities. Also on their minds: fears that they are wasting billions of dollars on ads that aren’t “viewable,” or visible to the human eye, or are being shown on sites with computer-generated fake traffic. The confluence of issues “could be a tipping point” for how marketers perceive digital advertising, potentially denting growth in the $194 billion global digital ad market, said Bob Liodice, chief executive officer of the Association of National Advertisers. The trade group represents large advertisers such as General Motors and AT&T. “Marketers are reassessing the level of investment in the digital area because they are beginning to question what they are really getting in terms of the return on investment,” Mr. Liodice added. The big question marketers are asking is “are we getting real value for what we are buying,” said Grant Leech, vice president of brand management for U.S. Cellular Corp. Despite their reservations, marketers will have little choice but to keep increasing spending on digital ads, especially on mobile devices, if they hope to reach consumers spending more time away from traditional media. In Facebook’s case, the company disclosed that the metric it reported for two years for the average time users spent watching videos was artificially inflated, because it only factored in video views of more than three seconds. Big ad agencies pressed Facebook for more details and ad buyer Publicis Media, a division of Publicis Groupe SA, was told that the Facebook error likely overestimated average time spent viewing videos by 60% to 80%, The Wall Street Journal reported. On Friday, Facebook apologized for the erroneous video metric. “While this is only one of the many metrics marketers look at, we take any mistake seriously,” said David Fischer, vice president of business and marketing partnerships, in a Facebook post. The Facebook revelation played into a narrative among some Madison Avenue executives that large online platforms are unaccountable “walled gardens,” doling out limited information on how media or ads are consumed on their platforms. “The primary concern for me is the walled garden needs to disappear and they need to be treated like other vendors with a level playing field,” said Ron Amram, vice president of media at Heineken. He said he and his agency are meeting with Facebook next week to discuss the impact of the metric discrepancy. The news holds implications for companies competing with Facebook for ad dollars, from legacy publishers to, increasingly, TV networks. Facebook has been gaining momentum—it has a 22% share of the $46 billion U.S. mobile ad market, according to eMarketer, and its mobile ad revenue jumped 80% in the latest quarter. Those competitors are looking for ways to drive a wedge between the tech giant and advertisers and might look to exploit the video metrics snafu. Sites including Facebook, YouTube, Twitter and Snapchat boast of the number of people watching videos on their services. 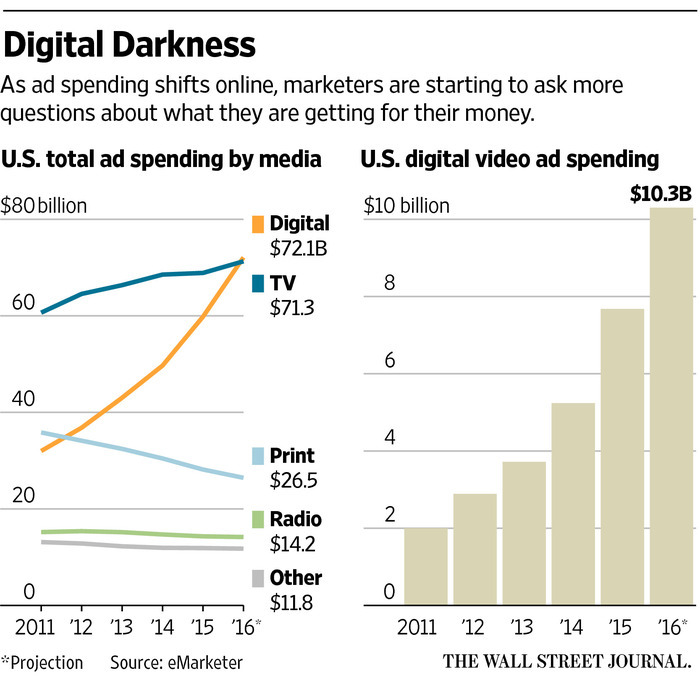 By contrast, Nielsen ratings in the TV business serve as the standard currency for ad deals. While ad buyers and TV networks have made a sport of complaining about Nielsen ratings data for years, marketers are happy to have an independent party to rely on. Big online platforms are “telling you what they are worth and it’s difficult to verify it,” said Mr. Leech. Still, Mr. Leech isn’t ready to cut his digital spending. “If we don’t get broad third party verification in the digital media industry, it will impact how marketers invest their money,” said Keith Weed, Unilever PLC’s marketing chief. Some ad executives played down Facebook’s misstep, saying the metric wouldn’t have materially impacted ad spending by marketers. Still, other ad executives say Facebook’s overestimation of time spent on video could have impacted how much money marketers allocated to the platform and misled them on how effective their ad campaigns were. “They told us certain things that made more positive than they were and probably led to more money in their direction,” said a large Facebook advertiser. One ad buyer said Facebook may not feel it needs to offer credits or money back to advertisers since his team buys Facebook video ads based on a guaranteed number of impressions, as opposed to the length of time a video was viewed, he said. Rob Norman, chief digital officer at GroupM, said what is needed now is the ability to get more granular data on video viewers. “We need to count them, know who they are and the degree to which they are paying attention,” he said. “The biggest issue for clients is to be able to make decisions about allocating budgets between channels,” he added. —Alexandra Bruell contributed to this article.